Takayasu arteritis (TA) is a perplexing large vessel vasculitis that had been recognised for more than 200 years but continues to be a big therapeutic challenge for the physicians. It is a rare type of vasculitis, that causes vessel inflammation. In refractory Takayasu arteritis, the inflammation damages the large artery that carries blood from the heart to the rest of the body (aorta) and its main branches. It can lead to blockages and narrow arteries known as stenosis or there will be a problem of aneurysms (abnormally dilated arteries). The aorta and other major arteries including the arteries of head and kidneys, become inflamed. With time, the inflammation causes changes in these arteries, including thickening, narrowing and scarring of arteries. What are the Symptoms of Refractory Takayasu Arteritis? In some cases, there are no symptoms but one may need medications to control the inflammation in the arteries and to prevent the complications. It often occurs in 2 stages. Weakness in the limbs during movement. When a physician examines, noises are heard over the arteries (bruits) when he listens with a stethoscope. What are the Causes of Refractory Takayasu Arteritis? It is considered as an auto-immune disorder in which immune system attacks the body’s own arteries by mistake. The disease can be aggravated by virus or other infection. What are the Complications of Refractory Takayasu Arteritis? Hardening and narrowing of blood vessels. Modern treatment focuses on controlling the inflammation with medications and preventing further damage to the vessels but the disease can sometimes be difficult to treat even if the patient appears to be in remission the disease might still be active. Allopathic treatment provides corticosteroids to control the inflammation and other drugs to suppress the immune system but all of these have possible side effects. In some cases, bypass surgery is also recommended. 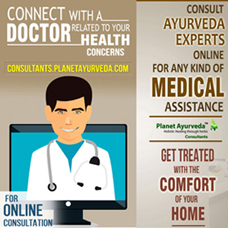 Ayurveda, on the other hand, aims at striking at the very root of the disease. A real cure for this disease is only possible if we adopt a holistic approach. The old principles of healing are scientific. They are considered as unscientific just because they are old is most unfortunate. 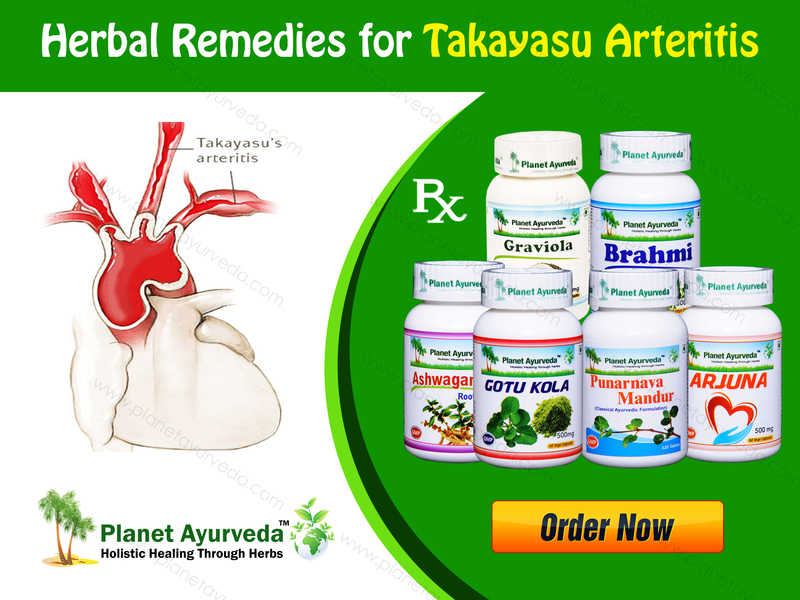 Planet Ayurveda offers an effective and natural treatment for refractory takayasu arteritis which works on the root cause of the disease and does not cause side effects at all. Centella asiatica is known by the name Mandukparni. It is known for its neuroprotective properties. It also acts on the skin, lymphatic system, heart etc. It improves the blood circulation by inducing the relaxation of veins. It also reduces stress and anxiety by pacifying Pitta aggravation in the brain. The Indian herb Ashwagandha has outstanding stress relieving capability that can be comparable to powerful drugs prescribed for the treatment for stress and depression. Ashwagandha herb is used in many cases like muscle weakness, fatigue, heart problems etc. Its anti-oxidant property can treat the process of aging as well. It also acts as an immunity booster. Arjuna is known as Terminalia arjuna botanically. This plant is mainly used for heart diseases due to its cardioprotective and cardio-strengthening properties. It strengthens the cardiac muscle and also normalises the heart-beat. It is a good source of minerals also. It reduces the inflammation in the blood vessels and coronary arteries. In addition, this herb also checks cholesterol deposits as well as plaque formation thus also helps in reducing cholesterol. Punarnava Mandoor of Planet Ayurveda is an Ayurvedic medicine containing iron content and is useful in a number of health complaints like anaemia, inflammation, removes toxins from the blood, edema, kidney diseases etc. Graviola (soursop) possesses so many medicinal properties. Graviola capsules of Planet Ayurveda gives the benefit of Graviola herb. This herb possesses anti-inflammatory, anti-viral, anti-bacterial, astringent, anti-cancer properties. It is a rich source of vitamins and minerals such as Vitamin B1, B2 and C. It’s stem bark and leaves are rich in anti-oxidants mainly coenzyme Q10 that can fight inflammation and removes free radicals. Brahmi (Bacopa monnieri) is considered as a powerful adaptogen. Adaptogens are natural herbal compounds that cope with stress in the body. It reduces the day-to-day mental stress on the brain, heart as well as on the overall health. It is used in anxiety, depression and improves brain retention power. It also improves peripheral circulation in the body. Heart needs a regular supply of oxygen and it also not be overstressed. Ayurveda suggests nourishing yoga practices such as Sun salutation as well as daily breathing exercises (Pranayama) but excessive exercise is not recommended that will leave a patient tired. Ayurveda considers functions of heart and mind inter-linked. Disturbance in one affects the other. Therefore, patients are advised to refrain from anxiety, excessive worry and insomnia. Avoid junk food, fried and spicy foods, poor quality oils, hydrogenated oils, tea/coffee and alcohol. Include fresh fruits and vegetables in the diet.